I really liked this book. Like, a lot. 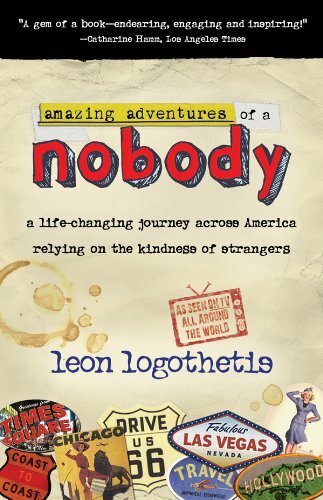 The author, Leon Logothetis, leaves his life behind in England and decides to travel the US, from the East coast to the West coast, with $5 a day and the kindness of strangers. He can only receive generosity from strangers, but not money. Tired of his disconnected life and uninspiring job, Leon Logothetis left it all behind—job, money, home, even his cell phone—and hits the road with nothing but the clothes on his back and five dollars in his pocket, relying on the kindness of strangers and the serendipity of the open road for his daily keep, all of which will inspire a life-changing decision. Along his way, he offers up intriguing and charming tales gathered along his journey. You’re struggling in life and need something to spur new ideas in your head about what you should do with your life. I think this book could do that.